One game that didn't get leaked this E3 was The Awesome Adventures of Captain Spirit, announced at Microsoft's press conference. It comes from DONTNOD Entertainment, creators of Life is Strange. Captain Spirit is also set in the Life is Strange universe, and tells an original story about the titular character. 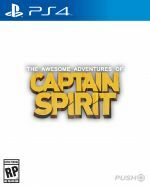 The official blurb reads, "In The Awesome Adventures of Captain Spirit, you play as Chris, an ordinary 10-year old boy who dreams of being a superhero. Chris has a big imagination that will take him on all sorts of adventures, but on this particular Saturday something truly extraordinary will happen to him..."
The game launches on 26th June on PS4, and what's more, it'll be available for free. Are you going to pick this one up? Use your imagination in the comments below. Is this a the first episode is free kinda thing or it's just one episode and it's free? I don't understand how this can be free. Surely it's just a first episode or something? I thought the trailer for this was adorable. I'll look out for this, as I'm interested in what direction it'll take. LiS was good with detailing some teenage struggle, and I hope the take on a kid will be good. @Splat I think it's just a spin-off from Life is Strange, and not an actual sequel. Which is good news, because it looks kinda meh. Is that Macaulay Culkin? In all honesty, this looks pretty cool. I would have bought it, but sure, if they want to just give it me. Not impressed. Surely there's more to it, but this trailer just looks like a kid playing make-believe in his backyard. Not exactly a thrilling concept. No thanks. I'll take the one with the murder and twin peaks like mystery. @get2sammyb You're having a good E3 so far aren't you. Looks great. Glad it's coming so soon and at least the first episode for free? I'm in for sure. either it is the first episode or it is just a small spin off the length of just 1 episode. can't see any other reason to have it be free. @rjejr Haha. I like what I like. How are Dontnod working on so many projects at once? @Splat Sammy would be like Batman at the end of that Arkham VR game. Well at least I think he would, I still have no idea what was going on. We wouldn't hear from him for awhile that's for sure. Day 1 play for sure, even if it wasn't free ! I've always wanted to play as a little boy superhero . TBH this trailer makes me want to play Life is Strange for the first time, soon as I beat Batman: Arkham Knight. It's the first episode being free. Telltale does this as their title becomes a few months old. Usually to get you hooked and to buy it. But this looked interesting and up my alley.